A lot of packages are sent daily by online shops troughout Europe. It can happen that there is something wrong with one of your shipments during the shipment process. In this article you can find steps to follow when your package, for example, is delayed or can not be traced. To start a research regarding your shipment you use your SendCloud panel. Submit a ticket in your SendCloud account by using 'Support' in the left-side menu. 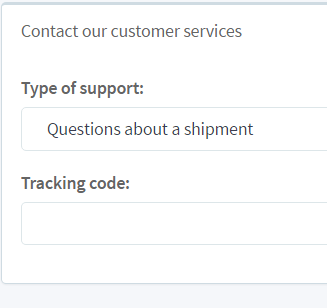 Select at type of support: 'problems with a shipment'. 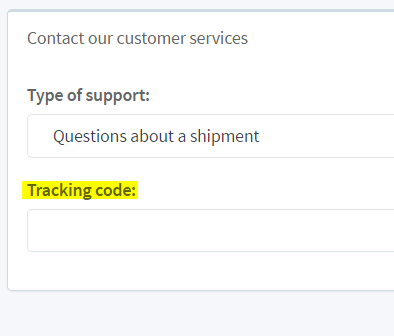 When you choose 'Questions about a shipment' the contact form asks for the track & trace number of this shipment. When you fill this in and press 'Find my shipment' we get the sender and receiver address to accelerate the research at the carrier. Attention! It is only possible to start an investigation on a shipment when the shipment is older than 24 hours. This is mandatory for the carrier because the statuses are updated throughout the day from the shipment is picked-up/handed in at the parcel shop. After choosing one of the options above send in a parcel description (how does the package look) and send a description of what is in the package. With this information the carrier can accelerate the research for your package. When everything is filled in, press the 'Send' button. With this action, a ticket will be sent to the support department of the carrier. I have submitted a ticket, now what? Thank you for informing us! The carrier has a 5 day research limit. Please respect this limit, many times we can get information way more quickly. However, when a package is missing this will take more time. We will keep you updated by e-mail. You can find the contact form here.